On my second morning in Banaue, my hosts at Evergreen Hostel, Jo and Mariana, packed me a lunch and sent me on my way to go hike the Batad rice terraces. I hopped in a pedicab with Jose, whose big, toothless smile could only make me smile. Jose was the owner's brother, so I knew I was in good hands. As we headed into town, another guy jumped on the back of Jose's motorcycle. I had no idea who this guy was, but he was clearly along for the ride. It wasn't until we stopped to get fuel (which, I might add, comes in a large, glass Coca-Cola bottle!) that Jose introduced me to Gressler, who would be my guide through the Batad terraces. So, Jose was my transporation there, and Gressler was my guide once we reached said destination! The road to Batad was winding, but offered the most amazing views. The road hugs the side of a looming mountain and the town of Banaue gets smaller and smaller as you get higher and higher. I asked Jose how long the road had been there, because it took nearly an hour to reach Batad by pedi-cab so I couldn't imagine walking it. He said the road was completed in 2015, but up until then, the people hof Batad would have to walk 4-5 hours into Banaue to restock items for their shops and homes. Once we reached the saddle, Jose gave me another toothless grin and said that he would be waiting until we got back. Gressler and I started off into Batad. The hike into Batad took about 15 minutes, although there are some (rudimentary) stone steps that lead into the town. As we rounded our first corner, I had my first look at the Batad rice terraces. Jose explained that they were built by hand over 2,000 years ago. We passed through a few shacks that sold fruit and water. Plus a bathroom. And that was when I was offered my first stunning view of the Batad Rice Terraces. This trip up to the northern, less visited region of the Philippines was already well worth it. Gressler showed me the route we were going to take: down to the rice terraces, across them, and eventally behind them to reach the water falls. And then back! We climbed down to the rice terraces, the steps getting steeper and stepper. Once we reached the terraces, it was incredible to walk between them. Each terrace is divided by stones that you can walk on. That part was quite easy and you could see each individual rice planting. Several times we passed by women, knees bent, back curved, hands reaching down to individually plant each rice seedling. Their skin was bronzed by the sun and they wore large hats to protect them. One by one, painstakingly slow, they planted rice in their family's rice terrace, which has been handed down by generations. We made our way across the rice terraces until we reached a lookout point (really it was just another shack). There were other backpackers resting. We started our descent to the waterfall, which was admittedly harder than I thought it would be. The way down very steep. There were steps, but some were small and others were over a foot high. Just as I thought that I was keeping pace with my guide, I felt a sharp, sensation throughout my right knee. The pain increased for most of the descent until we reached a resting point. After resting it, the pain subsided. I felt old for 26! But within thirty minutes, I could hear the rushing of water. The waterfall was massive, a collection of rainwater from the mountains. We got there right before noon, so it was the perfect time for me to eat lunch. The water was cool and perfect to refresh in and I chatted with a few backpackers as we relaxed in the sun. After an hour at the waterfall, we started our journey back up. It was harder going up than down! Gressler and I were both sweating. By the time we reached the lookout, clouds had entered and the temperature had dropped. As we were hiking, Gressler and I got to know eachother. I told him about my family in the Philippines and in the US. I told him about fundraising for a children's hospital, where I went to school, where I was going in the Philippines. Gressler grew up in Banaue and has been leading treks since he was 16 years old. 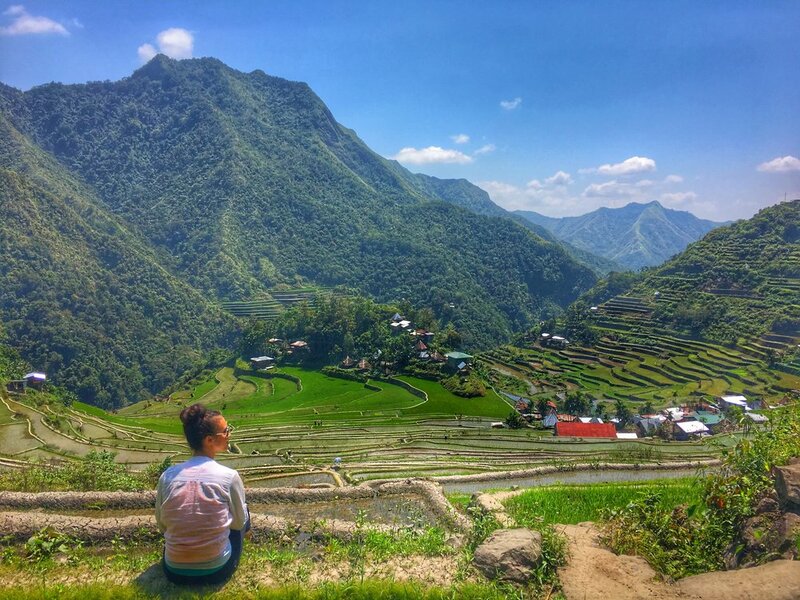 He's 34 now, so the Batad Rice Terraces have been most of his life. He went to uni in a town many hours away, then came back to Banaue to have a family of his own. He has one daughter and two sons. He also has two brothers and five sisters. Being the eldest, he felt a responsibility to take care of his family and he still sends money when he can to his sisters who are in college so that they have some spending money. That resonated with me because my dad has always sent money back to his siblings in the Philippines. At about 2:30, we left Batad and got on the back of Jose's pedicab again. We sped off to another small town (the name honestly escapes me), which had already planted rice seeds. The rice terraces were much greener and abundant than Batad's, with the village nestled perfectly in the middle. Jose and Gressler chewed tobacco and we joked around posing with the pedicab until we decided it was time to head back to Bananue. There was a slight drizzle, but it was welcomed after so many hours in the sun. We continued along the winding road -- how Jose rides so fearlessly on a one-way street when he has no idea if a Jeepney is barreling in his direction is beyond me. At the same time I was wondering this, I felt the motorcycle suddenly give and the tire squelch against the wet pavement. We began violently skidding towards the edge of the pavement, and it took me a milisecond to comprehend that there was no baricade between the road and the edge of the mountain. Gressler had leapt off as Jose regained control of the motorcycle, and in a split second, he had righted it and the front wheel. As Gressler climbed back on, Jose gave me another grin and quipped, "It slippery!" I came back to my hostel exhausted but exhilarated. Time in the north, surrounded by lush greenery and the kindest locals, was just what I needed. 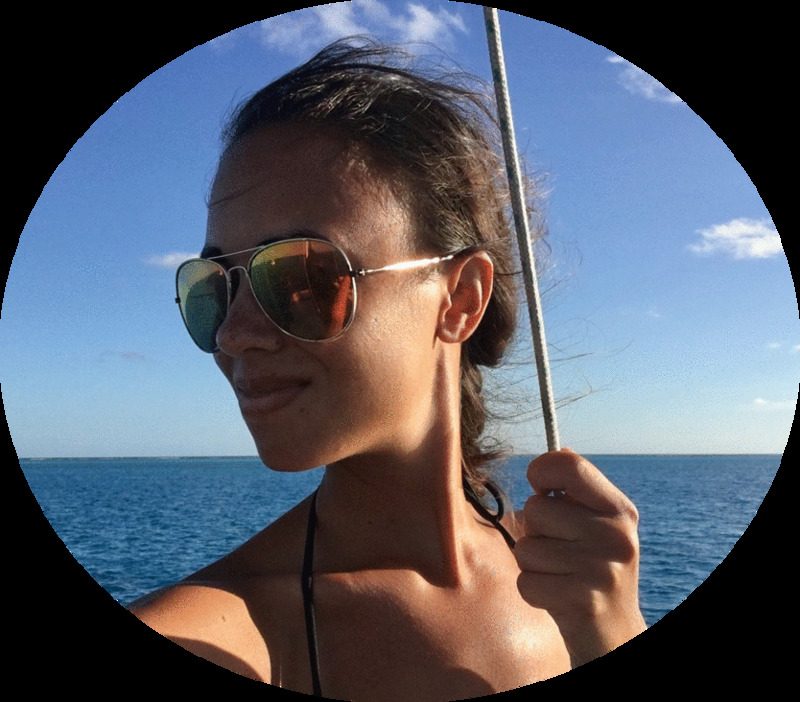 It was a departure from my normal travel escapades, which admittedly revolves around scuba diving and islands. I loved experiencing something different and putting my muscles to work with a few challenging treks. Even more, I loved getting to know the locals. Jose and Gressler made sure I had an amazing experience that day. Jose insisted on taking me to the bus station himself the day I left so that he knew I arrived there okay. My hosts, Jo and Mariana, spent time talking to me each night so that I wasn't eating dinner alone. On my last evening, Mariana gave me a necklace that symbolizes good luck. Then she asked for a selfie -- "You remind me of my daughter!" she said. Hiking the Batad rice terraces was one of my most memorable travel experiences to date -- for the amazing scenery and the locals.